Bleu French Laundry Promotions is promoting force formerly Austin-based Jennifer Marchand. Bleu French Laundry served music mecca Austin, Texas as publicist for live music events & bands, promoter for special events, as well as live music producer. Specializing in good vibrations, Bleu French Laundry was on soul-stirring assignment to get the buzz out on select live bands & keep them buzzing. Look for Marchand’s work in band interviews & features on radio programs, television broadcasts, entertainment weeklies, music magazines, as well as their online counterparts; independent music scene websites, social network websites, podcasts; in posters on bulletin boards & windows of the peoples’ coffeehouses & venues; in addition to major media outlets. With an eye on the modernization of promotion, Marchand dedicates herself to exploring new ways to get the word out without abandoning the grassroots effort. Further in the grassroots vein, Bleu French Laundry Promotions is inspired by not only the golden eras of modern music, but the roots, & continuously seeks creative ways to keep those eras valid & alive while supporting the current flow of talent. Bleu French Laundry booked Wednesday evenings, as well as select special events, in Austin, Texas, at The Sahara Lounge in Far East Austin, for over 3 years. The Sahara Lounge is the former home of TC’s blues club, & Lincoln Drive-In juke joint, located in the Hogpen neighborhood since 1962. Bleu French Laundry booked various acts including country rock, cosmic country, psych, folk rock, garage, rocknroll, rockabilly, honky tonk, americana, country western, blues rock, & pop rock weekly. 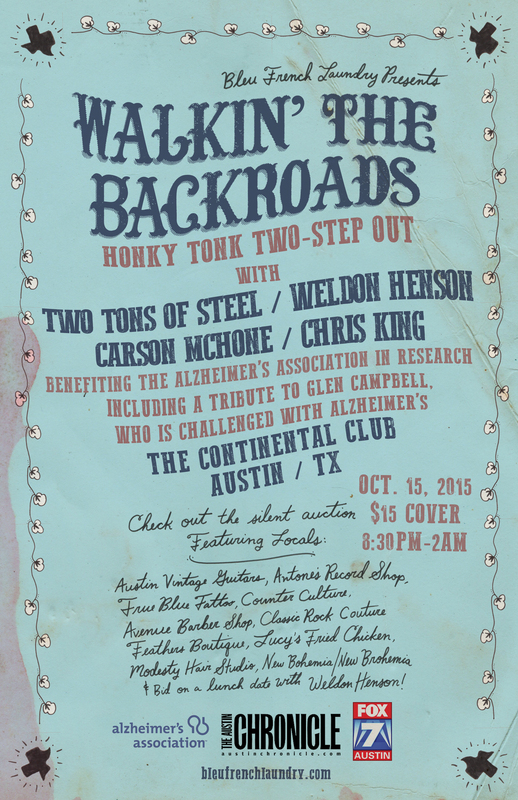 A Country Western Honky Tonk Revue is on the books for March 18th, 2015 at The Sahara Lounge in Far East Austin, Texas. 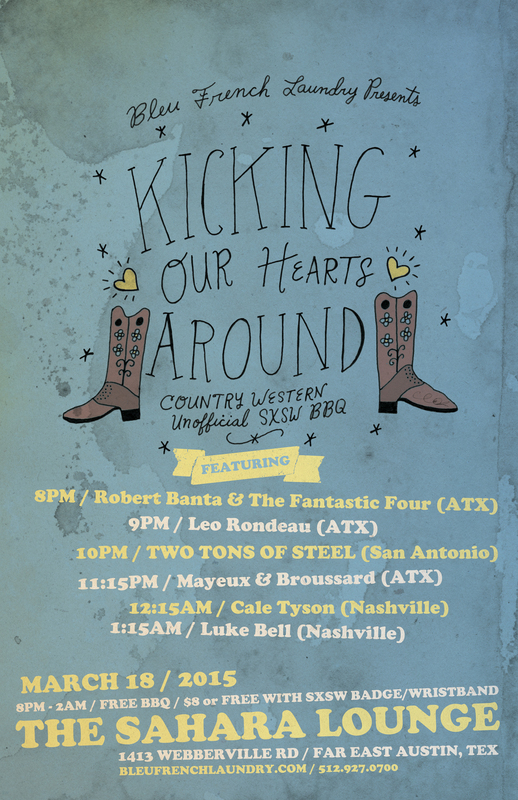 Bleu French Laundry Presents ‘Kickin Our Hearts Around’ Country Western Un-official SXSW BBQ, featuring beloved regional acts from Central Texas & Nashville, Tennessee. This one-off includes the talents of TWO TONS OF STEEL (San Antonio), Leo Rondeau (ATX), Cale Tyson (Nashville), Robert Banta & The Fantastic Four (ATX), Mayeux & Broussard (ATX), Luke Bell (Nashville). Kicks off at 7pm. Come early for free BBQ! Bleu French Laundry Presents FREE WEEK 2015! Original homegrown rocknroll takes center stage at The Sahara Lounge in Far East Austin, Texas come Wednesday, January 7th, 2015 for the legendary local Free Week. BFL presents five solid gems for regional music lovers to unearth during this, the first week of the New Year. This stand alone showcase will feature artists in hot pursuit of their rocknroll dreams, kick off at 7pm, be free to the public, sponsored by KLBJ, & include the talent of Elijah Ford & The Bloom, Nic Armstrong & The Thieves, The Sweet Nuthin’, Danny B Harvey w/ Annie Marie Lewis, The Rotten Mangos. Jennifer Marchand proudly held the role as publicist for Austin Psych Fest (currently known as Levitation) in the birthplace of psychedelic rocknroll, Austin, Texas. After helping to successfully launch the first 2 years of APF, Bleu French Laundry decided to take a pr hiatus. Here’s the latest on APF: Austin Psych Fest will be in it’s 6th technicolour year in 2013 & already the plans for APF are looking over-stimulating. Look for waking dreams of even bigger acts & multi-stage presentations, with an expanding national & international flow of psych music lovers at the happening. 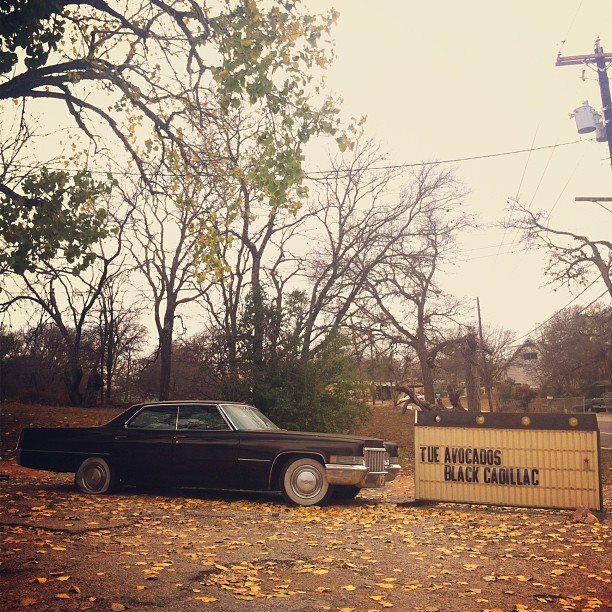 The 6th Annual Austin Psych Fest stands on the books as a destination event in late April 2013. “Austin’s third eye opened for the second time around noon on March 8, when the Red Barn unlocked its doors of perception for Psych Fest #1. Ground zero for Austin’s post-millenial psychedelia. Bleu French Laundry Promotions proudly served as publicist for the late legendary rock icon Sky Sunlight Saxon of ’60s flower power garage rock group The Seeds. It was only Spring 2009 that Jennifer met & began representing Sky, when quite suddenly he grew ill & passed away on June 25th, 2009, in Austin, Texas, God rest his soul. Sky had many projects in the works that will undoubtedly still be completed & released in the coming monthes if not years due to his wealth of creative material left behind. “Part of the impetus for the Seeds documentary is to correct a lot of the misperceptions about the band,” explains documentary-maker Alec Palao, “and to properly state their role and achievements, and celebrate their music for what it is.